We’re so excited to welcome today’s guest- Cheri from I Am Momma- Hear Me Roar. We consider her the Queen of Guy Crafting-she’s joining us with a simply fabulous tutorial for Gifts for Guys! 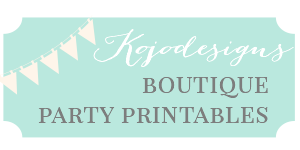 Hello Kojo friends! I’m Cheri from I Am Momma – Hear Me Roar. I’m excited to be here today, posting on such a great topic for a series. Who doesn’t have troubles finding guy gift ideas? Well, let me take you through my thoughts here. I wanted to think of something my hubby would like, but here are the issues. 1) He buys things when he really wants them. 2) We try not to do big Christmas gifts for each other and we’re trying not to spend money, which usually leads me to more sentimental-type gifts. 3) It’s hard to “make” something for him that’s not too girly. So, after thinking it over I thought it would be fun to come up with a fun reminder of his family while he’s at work. 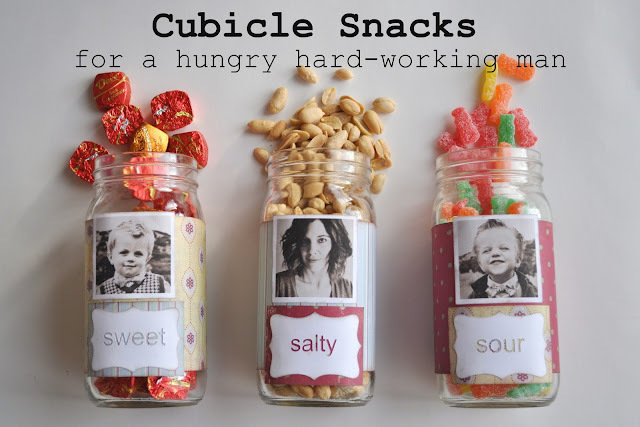 He works long hours and likes to have snacks on hand, so may I present Cubicle Snacks for the working man. It’s always nice to cover your sweet, salty, and sour food groups. Plus, I thought it would be funny to post a picture to go with each flavor. Then he has pictures of his family to show people at work as well. Yup, I’m “salty.” That’s my salty look 🙂 The idea is simple, easy, practically free, and useable. And, you know what they say…. The tutorial is quite simple and obvious, but let me give you a few tips. I used the jars I bought our peaches in. (You could use spaghetti sauce jars.) I removed the label and washed them. I found cute, coordinating scrapbook paper that wasn’t too girly. I cut 4″ strips and attached them tightly to the jar with double sided tape. I printed out little pictures to use (2″ by 2″). I just used regular paper and my own printer – nothing fancy. I used my mom’s new Silhouette to cut the labels, but you could easily print some off or draw your own. I antiqued the edges of all the paper with a small ink pad. Then I attached it all with the double-sided tape, which I really liked because I avoided the mess of glue. I spray painted the jar lids black just because I thought they looked cuter that way. 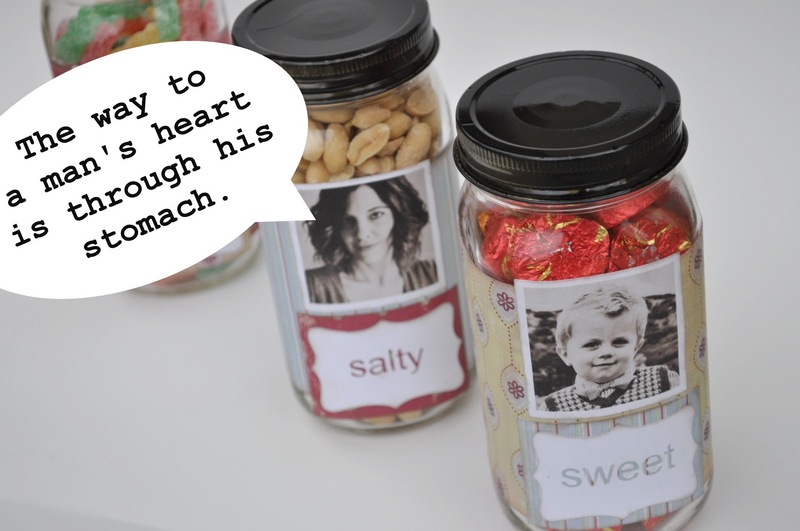 Lastly, I filled the jars with some of his favorite snacks. You could easily do more flavors if you have more family members. If you are still hunting for some extra “man gifts” I made my husband a fun shirt HERE. If the man in your life wears a lot of ties he might like THIS. Good luck! Thanks for having me Kirstin and Jordan! All of you are welcome at my blog any time. For more fantastic boy/guy related goodness (as well as a plethora of just general fabulousness), be sure to check out Cheri’s blog… she just finished up a refashionista series and adds terrific stuff almost daily to her accumulation of creative goodness! Now that is a cute gift idea! Love it! 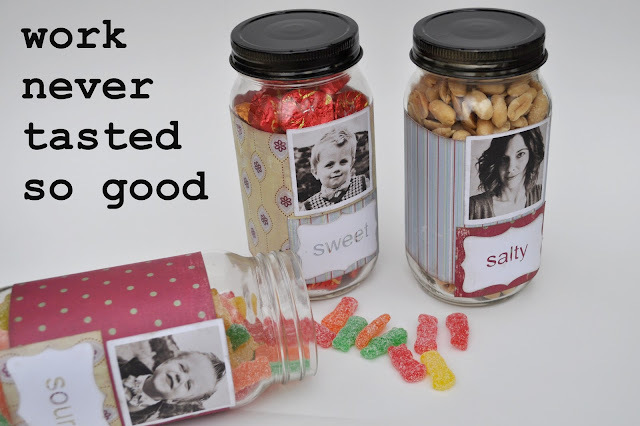 Great idea to add the pictures and to paint the lids! Oh!! Really nice picture post in this blog and crucial information sharing in this blog..Thank you for sharing with us..
great idea! perfect for my hubby! Can we say BRIllIANT!!! I'm so doing this! What an awesome idea! What a cute idea, Cheri! I love the pictures you put on the jars as well. My post here will also be food because it is definitely true around here that a way to man's heart is through his stomach! Cheri…bravo. These are great for my husband. His grad student office snack supply needs some serious re-stocking. I love that you incorporate pictures of you guys in there too. You are a genius. That's a good idea! I like your pictures, by the way! This is such a creative idea! I love to mail my husband letters to his office from our kids, but this would take it to the next level!